Ambrosia trifida. David G. Smith. discoverlife.org.jpg (Accessed 12/2014). Ambrosia trifida is an annual, 1.5-2.8 m tall, roots fibrous, short taproot, stem rough-hairy. Ambrosia trifida leaves. © Copyright Bobby Hattaway 2011 · 5. discoverlife.org (Accessed 8/2017). Leaves opposite, stalks winged, blades palmately 3 lobed (occasionally 5 lobed or without lobes), to 15 cm long, 10-20 cm wide, tips pointed, base rounded, veins palmate at base of blade, secondary veins pinnate on lobes, margins toothed. Ambrosia trifida.flowers.© Keir Morse. New England Wild Flower Society. 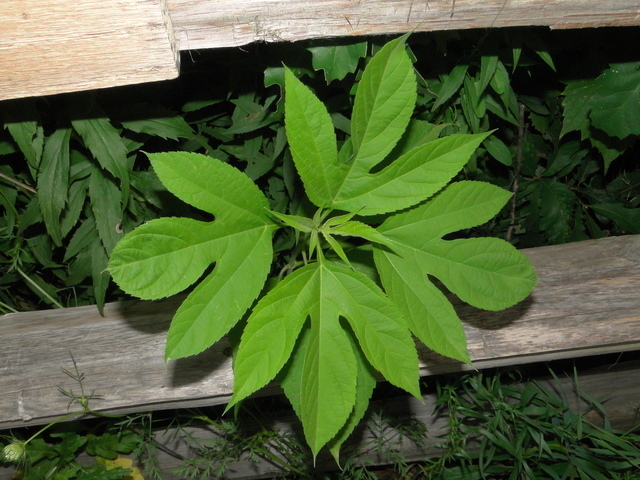 gobotany.newenglandwild.org (Accessed 1/2015). 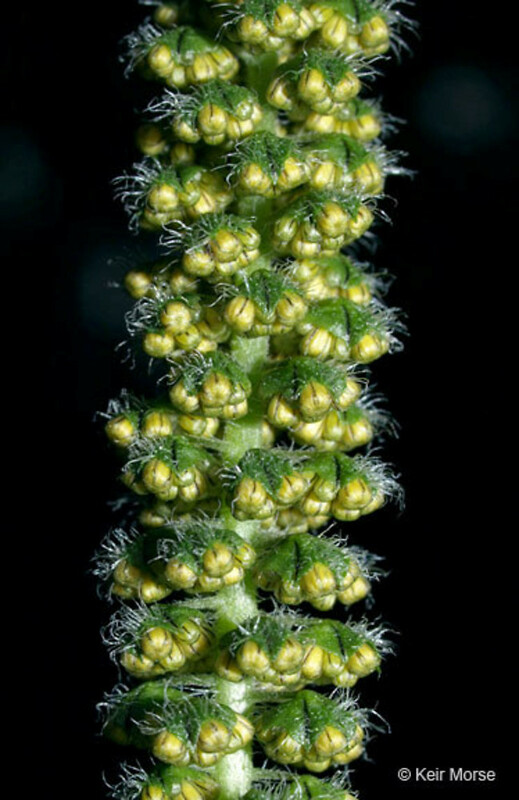 Flowers green, minute, in small heads subtended by bracts, no ray flowers, heads 0.5-1 cm long, all male or all female, females in clusters at base of inflorescence spikes; inflorescence of spikes to 30 cm long, at ends of branches, wind pollinated and self-pollinated. A short-day plant. It flowers earlier than A. artemisiifolia; wind pollinated, producing large amounts of spiny, allergenic pollen; ;July-Oct.
Ambrosia trifida fruit. By Ken Chamberlain. Copyright © 2017 CC BY-NC 3.0. Bugwood – www.bugwood.org. New England Wid Flower Society. gobotany.newenglandwild.org (Accessed 8/2017). 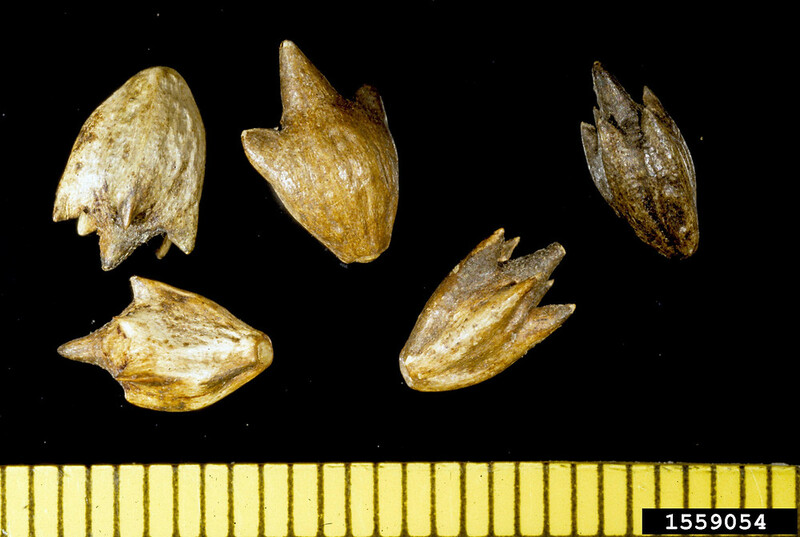 Fruit dry, 1-seeded, 0.5-1.0 cm, short-beaked with a ring of 5 shorter points surrounding beak (Uva et al. 1997). Seeds produced by self pollination not as vigorous as those produced by cross pollination. Seeds wind dispersed, fruit coat finely spiny, helps lodging and burial. Seed production can be 1399 per plant, but only about 1% germinate; seeds mature, Sept.-Oct.
Habitat: Moist to wet, open areas, flood plains, disturbed soil, construction sites, roadsides, edges. Notes: Seedling densities may be over 100 per m sq. Emerges in March and grows very fast, shading out other herbs. Light density reduced by 95% under ragweed plants (Bassett and Crompton 1982). Responds well to nutrient increases (Sickels and Simpson 1985). Foliage eaten by larvae of various Lepidoptera, including; Schinia marginata, S. thoreaui, Plagiomimucus and Ogdoconta cinercola (Noctuidae). A treehopper, Publilia concava also feeds on great ragweed. A number of fungi have been found on great ragweed including; Entyloma compositarum, Stagnospora ambrosiae, Erysiphe cichoracearum and Puccinia xanthii (Bassett and Crompton 1982). 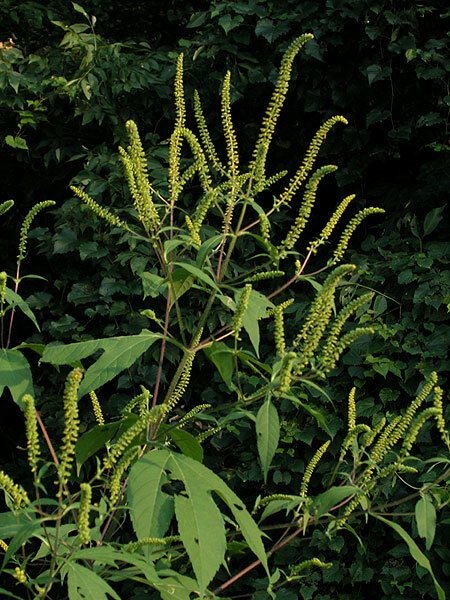 In Canada, great ragweed has only become common since intensive agriculture began after European settlement during the last 200 years. Marks (1983) hypothesizes that field plants, native to the northeast but dependent on open habitats, originally grew in marginal habitats such as cliffs, rocky outcrops and river margins where closed canopy forest does not develop or is often opened by disturbances. It is also likely that these plants were also common in beaver meadows.